**Reposted from my personal blog. The other day one of my friends told me she doesn't know what I do. My sister has told me the same thing before. I even have a wetland manager I interact with who doesn't know what I do. Sometimes I don't know either. It's hard to remember sometimes that everyone I meet doesn't know or care about Great Salt Lake wetland ecology as much as I do. As the conversation with my friend continued, we discussed Radiolab, and how great they are at bringing science to the masses. I'm a big believer in making science relatable and in helping people understand what I do and why they should care, but that's hard work. Everything about graduate school and academia drives you to focus on gaining acceptance from faculty members by catering to their area of expertise and to woo funding agencies by closely following their jargon-laden calls for proposals. All of that aside, I can't think of a way to make my research Radiolab-cool, but I don't have any impending deadlines and thought I'd take a shot at making my research understandable here on the blog. The official title of my project is "Determining the impact of impoundment and water management on Great Salt Lake wetland condition." Blarg. Long titles can be descriptive, but they're also mind numbing. To show you why you might care about my project I'll deconstruct the title to talk about four things: 1) wetlands are amazing, 2) Great Salt Lake wetlands are extra amazing, 3) impounded wetlands are intriguing, and 4) wetland condition is a way to answer my pressing questions. Upland, wetland, and aquatic ecosystems. The black line represents the soil surface, the blue line represents the water surface. 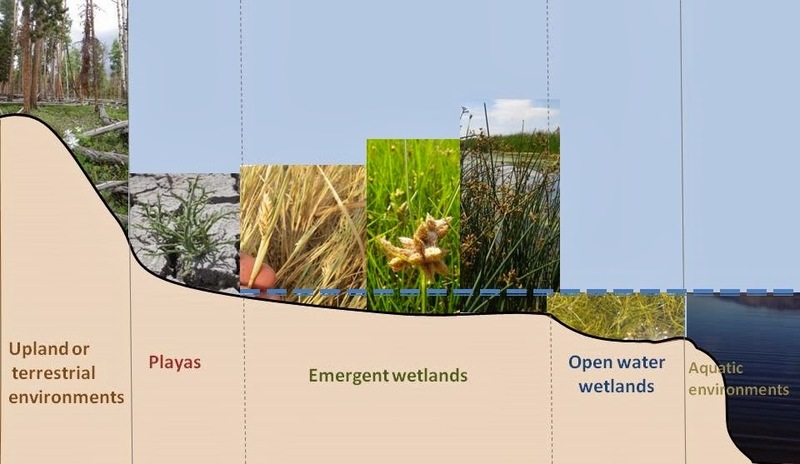 There are three basic features of wetlands that make them unique and awesome: water, wetland plants, and hydric soils. Water is what makes it all happen; water tends to be shallow in wetlands (less than 30 cm or 1 foot) and slow moving (like in ponds). All plants need water, but having too much water or water that flucutates a lot is stressful to plants because it makes attaining oxygen difficult. Only the toughest, coolest plants grow in wetlands, they're called hydrophytes or water-loving plants and have special adaptations that allow them to survive in wetlands. Pickleweed (Salicornia rubra) - my favorite - can live in water and very salty places by storing water and salt in its tissues. Its other common name is swampfire because it changes from green to red during the fall. Pickleweed can also be used to salt or preserve foods. Alkali bulrush (Schoenoplectus maritimus) thrives in wetlands with fluctuating water levels because it can reproduce by seeds on dry ground and through rhizomes that create another stem of bulrush that is still connected to the original plant under flooded conditions. In this way, alkali bulrush can form large, single species stands. Hardstem bulrush (Schoenoplectus acutus) can grow in deeply flooded wetlands because its stems are full of air pockets call aerenchyma that allow the stem to stay erect until it grows up through the water surface. These aerenchyma can then send oxygen from the parts of the plants above the water to the submerged parts. Lack of oxygen due to flooding also makes wetland soils different. Without oxygen bacterial decomposers work slower and organic matter tends to accumulate as muck (which is exactly like it sounds) or peat. The bacteria that survive in wetland soils often have to use an element other oxygen to complete cell processes that generate energy. 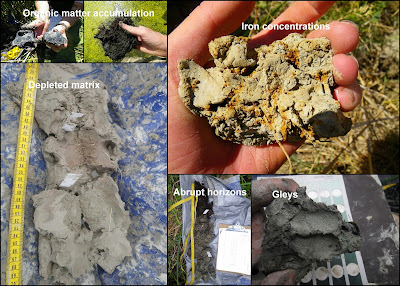 Nitrogen, manganese, iron, and sulfur are converted to different chemical forms by bacteria in flooded soils and that causes changes in color (in the case of manganese and iron) and smell (in the case of sulfur); these are the characteristics of hydric soils. Wetland soils are the best! If that isn't enough to convince you wetlands are cool, they're also great places to spot birds! Ducks, wading birds, colonial nesting birds, small birds, big birds, colorful birds, brown birds.... 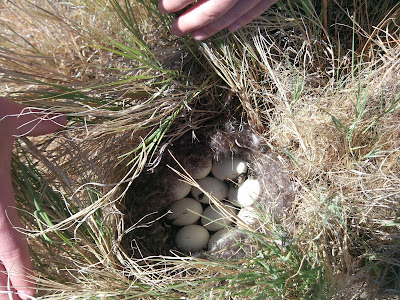 They come from all around (literally, because these birds are migratory) to eat, nest, and rest in the wetlands. This is especially true around the Great Salt Lake. 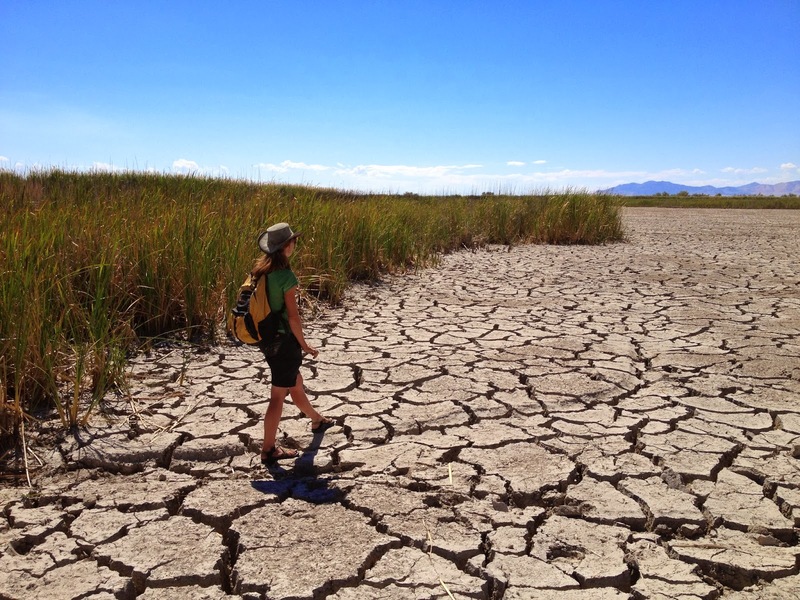 2) Great Salt Lake wetlands are extra amazing. Water is everything in wetlands. Well, water is really everything everywhere, a post for another time. Water is rare in the deserts of the western United States so wetlands are also rare, generally only comprising 1% of the total landscape. But around the Great Salt Lake (GSL) there are more than 400,000 acres of wetlands, primarily at the river deltas. 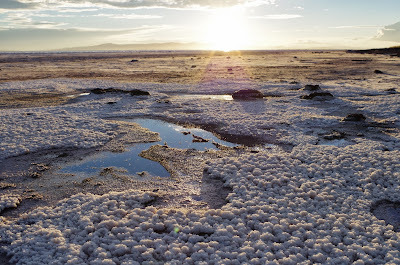 When most people think of the GSL they see barren salt flats and water too salty for anything but brine shrimp, but that's only part of the story. Three major rivers supply GSL: the Bear, Weber and Jordan. The rivers begin high in the Uintah and Wasatch mountains and descend 6,000 feet before reaching the pancake flat expanses of the GSL, where there is less than a foot of elevation fall per mile of distance. In fact, while the GSL covers around 1,700 square miles (more during wet years and much less during droughts) its deepest point is only 30 feet. When rivers meet these flat spaces they spread out into meandering deltas that often support expansive wetlands. The wetlands of the GSL have the freshest water closest to the rivers and the wetlands get saltier as they get closer to the main body of the GSL or farther upslope from the rivers. The salinity of the water, as well as how deep and how long the water stays around, determine which plants grow in wetlands. Where water is deepest and most permanent and fresh you get open water wetlands full of submerged aquatic vegetation (or SAV) commonly referred to as pond weeds, which grow completely under the water. Ducks love this stuff because they can eat the seeds and roots, which are full of nutritious stuff. Where water is shallower, usually less than 1 foot, you find emergent marshes; these are the wetlands I study. They're called emergent because the plants here grow up through (or emerge from) the water. Cattails, bulrushes, sedges, and grasses are all types of emergent plants. 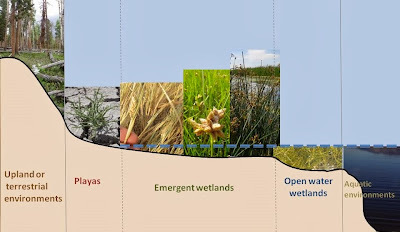 Water regimes, the patterns of flooding and drying within the wetland, can be very different in emergent wetlands, so emergent plants have the coolest adaptations to life in the water. 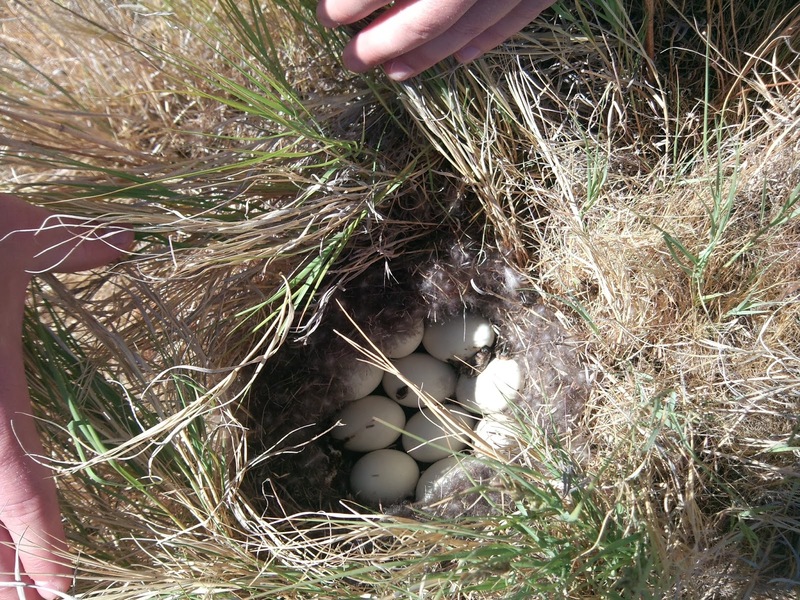 Birds love to nest in emergent wetlands, where they can find the materials to build and hide their nests. The saltiest wetlands that are flooded least often are called playas. Some playas are so salty the soil surface glitters with a crust of salt. 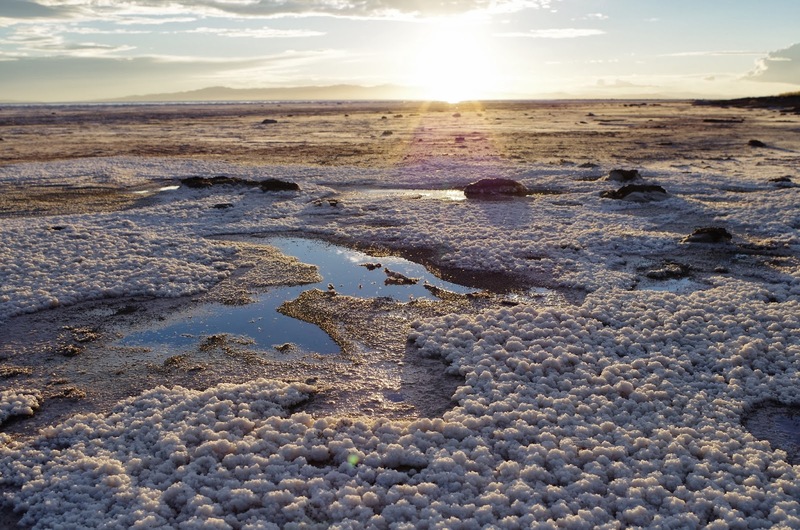 Playa soils might only be muddy during the peak of spring runoff or after a big storm, but when they're wet they're an amazing place to be. Playa wetlands are composed strictly of salt loving plants called halophytes. Shorebirds often nest on playas and larger groups of birds visit after rain storms bring out big blooms of bugs to eat. The water in the rivers that supply GSL is primarily from snowpack, every year there is a pulse of high runoff as mountain snow melts, the rest of the year there is much less water available. A series of reservoirs have been built on the rivers to capture all of this snowmelt water during the spring and then release it into canals and pipelines when people need it most (like during the irrigation season for crops). 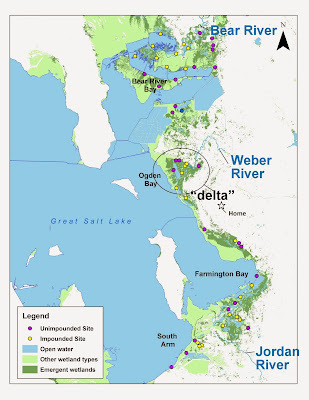 These rivers support the vast majority of Utah's 3 million people who live on the Wasatch Front, and extracting all the water they need from the rivers has caused significant changes to the deltas at the very end of the rivers, generally leaving less water for wetlands when it is needed most during the summer. Wetland drought is real, my friends. All those ponds with straight boundaries are impounded wetlands, natural wetlands don't have straight borders. Once you've created an impounded wetland you can manage it like a shallow reservoir to accomplish many habitat goals. If a manager wants lots of open water wetlands full of SAV they might keep the water three feet deep for the whole year. Another manager might want lots of emergent wetlands to support nesting birds so they would keep the water at a shallower level and draw the water level down below the soil surface during the summer. Wetland managers with impounded wetlands can also manipulate the salinity level in their wetlands by bringing in more or less freshwater. 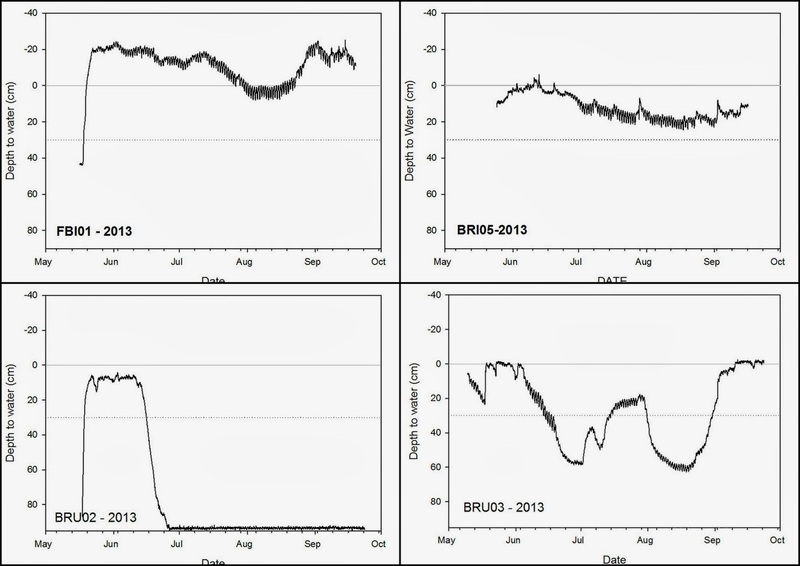 Really, there are many different management possibilities in impounded wetlands. With almost 200,000 acres of impounded wetlands around GSL and a large group of managers who may or may not talk to each other about what they do and the results they see from their management, it's difficult to know exactly what the best strategy for managing water in an impounded wetland is. When I was a research technician at USU (read: helper monkey) I spent a lot of time in these big impoundments wondering if the wetlands outside the dikes were different. I also wondered about the impact of the different management strategies I was seeing, some people chose to keep their wetlands flooded all the time, other people didn't have enough water available to keep their wetlands flooded at all that year. I wondered how managers were making decisions about what to do with their water and how they measured the impact of those decisions.... I had a lot of questions about these impounded wetlands so I decided to do three years of field work in GSL wetlands and then write a four chapter dissertation on the whole thing. 4) Wetland condition is a way to answer my pressing questions. Once I committed to a PhD project trying to figure out this whole impounded wetland business I had to figure out a way to measure the impact of impoundment and condition assessments seemed to be the way to go. My condition assessment is based on the vegetation within each wetland, which I will survey for at least three years. Based on a survey of the plant community, I hope to be able to say how much a site deviates from a natural state and how stressed a wetland is based on the plant traits mentioned in section 1. In this way, I can judge each wetland (and I'm surveying 50 of them) as excellent, good, eh, and poor. For example, a wetland in excellent condition would be composed only of awesome, native species (no weeds here) and have a water regime that looks normal (not too deep, not too dry). A poor condition wetland might have lots of weeds and spend too much of the year too dry to support cooler wetland plants. I have to do this for at least three years because I don't know what the most natural state is, or whether it changes during a flood year or drought year. I also didn't start with a good idea of what the water regime looked like and would like to track that for a few years to make sure I get it right. Every summer I go out to 50 sites scattered from Corinne to Saltair and look at what plant species are there and how much of the wetland they cover. I also dug soil pits to see how the soil might be different and I've installed piezometers to measure water level. Piezometers are wells I made that are stuck in each wetland as deep as three feet. In each piezometer I put a pressure transducer that measures the weight of the water in the well every hour, it then calculates that weight as a water depth. They're dang snazzy and show exactly how water levels change according to seasonal changes or management actions. Just look at the graphs I can put together with them. 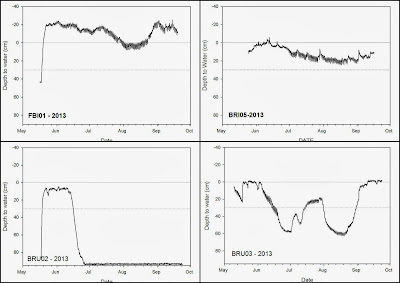 Examples of wetland water regimes put together based on my piezometer data. With all of this plant, soil, and hydrology data I hope to not only say what condition GSL wetlands are in, but also what the impact of impounding and managing water is on wetland condition. And to get at all those questions about what managers are doing with their water I'm going to conduct interviews with them. I'm pretty sure that these wetland manager's heads are full of all sorts of interesting and important observations about the wetlands they manage and I want to hear it all. I've only got preliminary results so far, but I can see that impounded wetlands are different from un-impounded wetlands because they are usually flooded for a longer part of the year. Because the water level is higher in the impoundments there are more wetland plants. In wetlands where the water level gets really low (more than 2 feet below the soil surface) I've found more species of plants you would usually find in drier places (I call them weeds, because I don't think they belong in my wetlands). Nodding beggarstick, a plant not often found in impounded wetlands. Now that you've read through all of this, I need a favor from you. Will you please do your snow dances or say your prayers about snow or send out your good snow ju-ju into the universe to help us toward a good water year in Utah? Please? Without a good winter this year I will have to do four years of field research, rather than three, because I need to see what GSL wetlands look like in a flood year, or at least a normal year. Since I started my project we've had two pretty severe drought years. I NEED MORE SNOW! Another year of field work wouldn't be the end of the world, but it would definitely delay attainment of my doctorate, and I want it ASAP. So there you have it, why I would study GSL wetlands and how I intend to determine the impact of impoundment. And my desperate plea for snow.